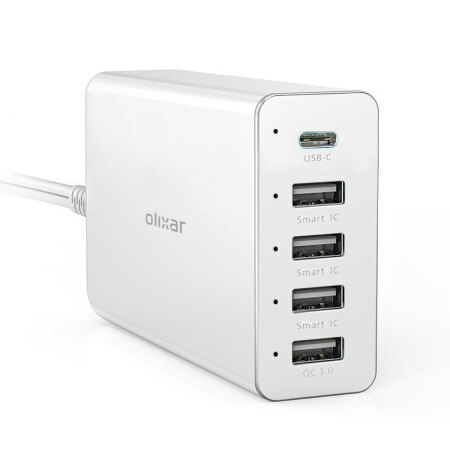 Featuring a dedicated USB-C port as well as a Qualcomm 3.0 socket for ultra-fast charging, this Olixar hub also features three standard USB ports for charging smartphones, tablets and any other USB-enabled device. Let me point that it’s powered by a 13 amp socket, i initially thought it might be connected by usb. What I really like is the fast charger, for the first time my unit hits 100% Charge every Charge, to me it’s worth it just for the fast Charge. Very pleased with this purchase. With so many electronic devices around the home or office, the need to find a free USB port to charge your device can often lead to frustration. End the torment and enjoy the power, versatility and high-speed charging capacity of the Olixar 5 Port Super Fast Mains Charger for smartphones, tablets and other USB powered devices. Usually to charge five devices, you may have needed 5 mains sockets. This is not always practical and is certainly not tidy. However, this is not a concern for the Olixar 5 Port Super Fast Charger. 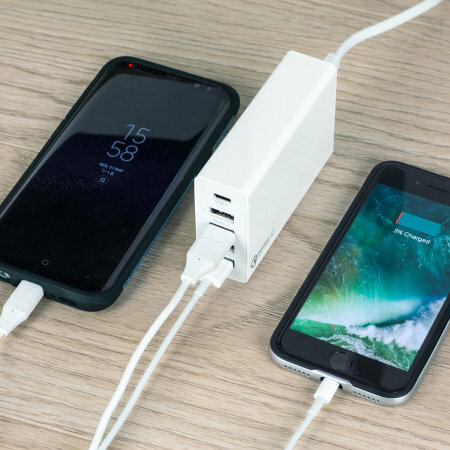 With just a single mains socket, you can charge up to 5 devices, and thanks to the Olixar 5 Port Super Fast Charger's mammoth 10A overall output, your smartphones, tablets or other USB-enabled devices will be raring to go in next to no time. 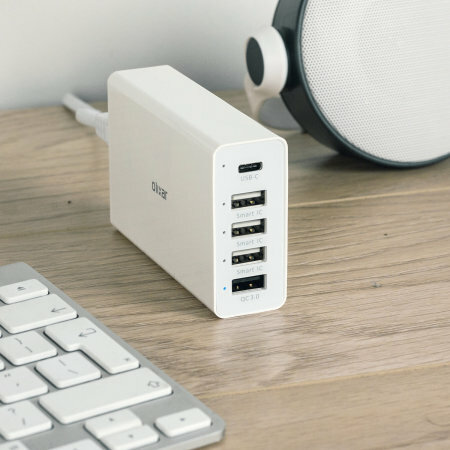 With a whopping 10 Amps total power output, you can simultaneously charge all of your USB powered devices fully from a single UK mains charging socket. With 4 USB charging ports along with one USB-C socket available, your whole family can charge at the same time - ending the squabbles and fully charging your cherished devices. What on earth is Quick Charge 3.0? Good question. 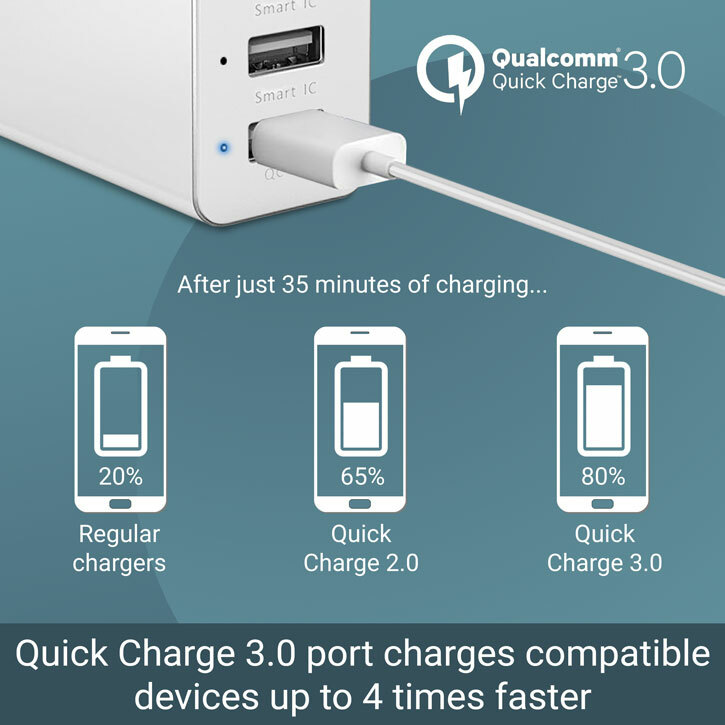 Quick Charge has been developed by Qualcomm so that devices running their latest Snapdragon processors can make use of significantly faster charging speeds. This represents up to a 4 times faster charging rate - a significant step forward in reducing charging speed, making this hub an absolutely essential accessory for anybody with a compatible device. Don't worry if you don't have a Quick Charge-enabled device, though: this port also functions perfectly as a standard USB connector, meaning you can still use it to charge any USB-enabled device. Offering up to an impressive 2.4 Amps output per standard USB port, the Olixar USB Charger allows for super fast charging speeds even from its standard USB ports, to make sure you're always ready to go without delay. 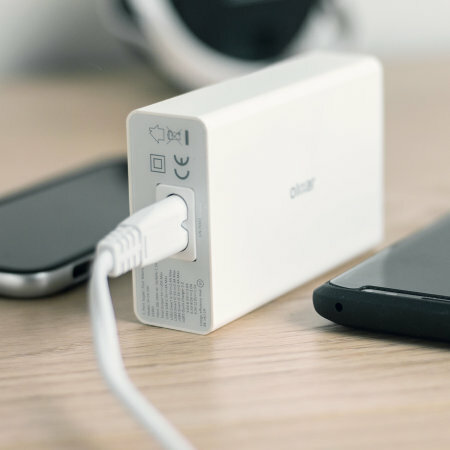 Suitable for even the most power hungry smartphones, tablets and other USB powered devices, the Olixar USB Charger will ensure once you are ready to go out, your devices are too. The Olixar 5 Port Super Fast Mains Charger features a dedicated USB-C port for all the latest smartphones and tablets. 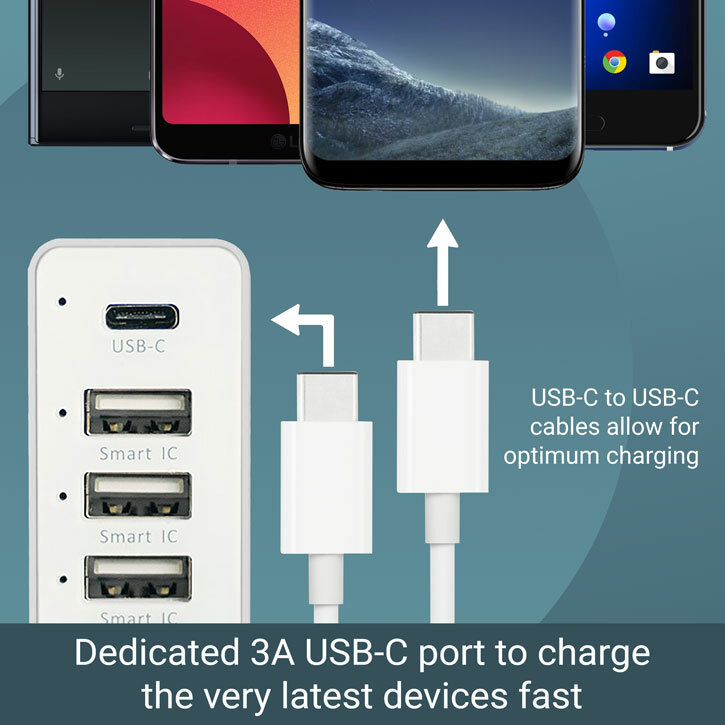 With more and more devices adopting this connection standard, you can be sure you're future-proofed for any new phone you buy, knowing the USB-C port on this charger is compatible. Not only that, but the dedicated USB-C port also offers up to 3 Amps of power, so you won't be left waiting around for your phone to finish charging. Don't worry if you don't have a USB-C phone or tablet, though, as this hub also features four standard USB ports which will quickly charge the vast majority of devices. 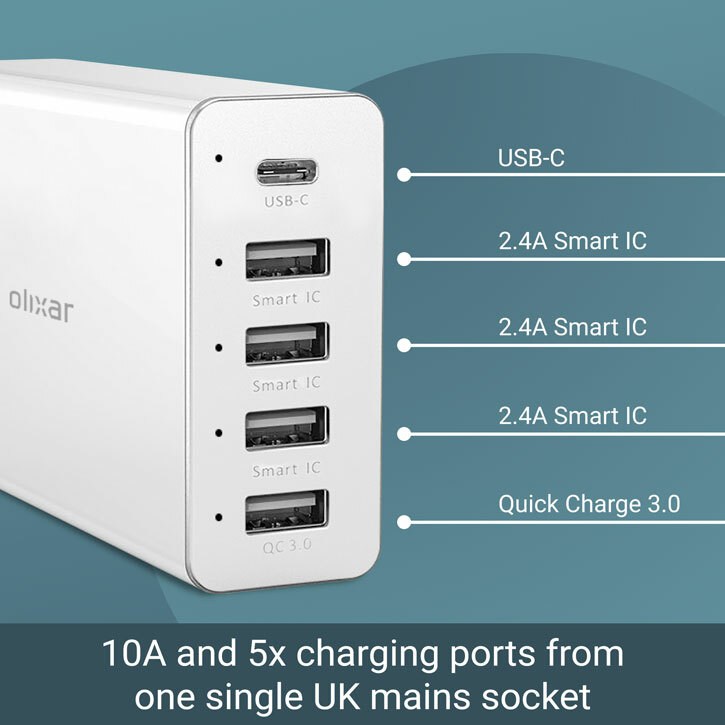 Powered by Smart IC (Intelligent Charging), the Olixar USB Charger automatically identifies Apple, Android and other devices to maximise charging speed. 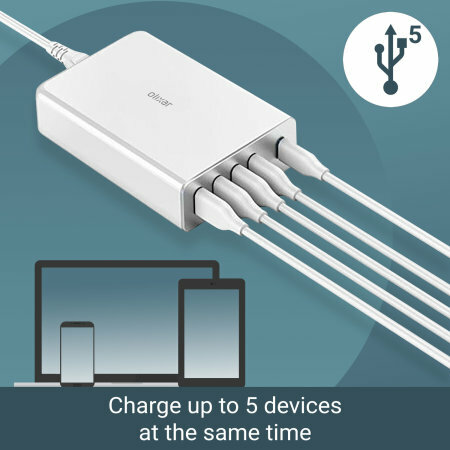 This ensures your devices receive the correct amount of charge it is capable of and also allows multiple devices to be connected safely to the USB charger. With an input voltage of 100-240V, you can take your USB mains charger with you on your travels around the world and ensure your phone is ready to take holiday snaps and your tablet ready to view them. With its detachable power cord, you can swap the standard mains adapter with an alternative - particularly useful if travelling abroad. Roughly the size of a pack of playing cards, the unit is also light enough to take to work or on holiday.